UNICEF Goodwill Ambassador David Beckham travelled to Indonesia this week to meet children who have experienced classroom violence and bullying, and to see how 7: The David Beckham UNICEF Fund is supporting anti-bullying programmes in schools. Since 2015 7: The David Beckham UNICEF Fund has transformed the lives of millions of children around the world. From vaccinating 400,000 children against polio in Djibouti to helping 15,000 children access clean drinking water in Burkina Faso to 14,500 children protected from violence and abuse in Cambodia, Beckham has seen just how much can be achieved when UNICEF invests in the potential of children. The 7 Fund is newly supporting UNICEF programmes in Indonesia, El Salvador, Nepal and Uganda to help children break down barriers and unlock their incredible potential. The 7 Fund is tackling bullying, violence, child marriage and missed education and making sure children – especially girls – get a true chance to realise their potential. As part of this, the 7 Fund is supporting programmes in Indonesia to empower girls and boys as advocates of change to speak out when they experience or witness violence. During his visit to Semarang in Central Java, Beckham met 15-year-old Sripun and heard how she has become a leader in her school to prevent bullying. Sripun has been telling her story on David’s Instagram stories; showing the world her home, family and friends at school. Peer violence and bullying are among the top issues concerning young people in Indonesia. More than one in five children aged 13-15 have been bullied, some 18 million children in total, and another one in three children have been physically attacked in schools. This violence increases the risk of poor mental health amongst children and leads to early school drop-out. 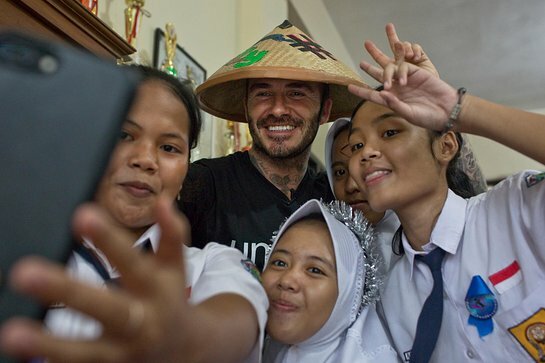 Beckham saw first-hand how schools in Indonesia are taking a student-focused approach by involving not only children who have been bullied, but children who have previously bullied others. Under the scheme, a peer nominated group is trained around issues of bullying and taught how to create positive environments, while teachers learn how to use positive discipline to ensure classrooms remain violence-free. Beckham learned that the current bullying prevention programmes in Indonesia have already benefited 7,000 children, with initial results indicating that bullying has been reduced by nearly 30% in early pilot programmes.